The Newport, RI stopover in 2015 was a remarkable success as the race’s only North American stop, and the City-by-the-Sea was quickly reselected as a host port for the next edition. The public Race Village at Fort Adams State Park opens on May 8. The boats are expected to arrive in Rhode Island between May 8 and 10. The In-Port racing will take place May 17-19 and the leg departure to Cardiff is scheduled for May 20. The 2,900-nautical mile transatlantic crossing is traditionally one of the global race’s biggest highlights and toughest tests for sailors in often challenging conditions. A sailor was lost overboard and a boat sunk in separate incidents during the Transatlantic crossing in 2006 on a leg from New York to Portsmouth, England. Cardiff has been chosen as the destination for the first Volvo Ocean Race transatlantic leg to the United Kingdom in 12 years, when the world’s leading offshore race makes its debut visit to Wales. Other stopovers already announced for the 2017-18 edition include Alicante, Spain; Cape Town, South Africa; Auckland, New Zealand; Lisbon, Portugal; and Gothenburg, Sweden. 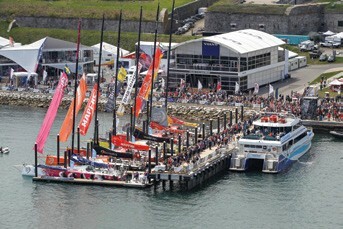 For more information, visit volvooceanracenewport.com.